One of the best things the Microtonal Weekend at Wright State University did for me was initiate me into familiarity with Ben Johnston’s Seventh String Quartet. Written in 1984, the piece has never been played. It has a reputation as being the most difficult string quartet ever written. 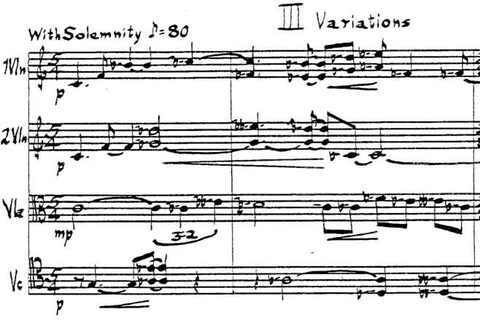 Timothy Ernest Johnson of Roosevelt U. gave a paper analyzing the third movement (his doctoral dissertation is on the entire work and also Toby Twining’s Chrysalid Requiem), and for the first time I learned exactly wherein that difficulty consists. If you know much about Ben’s Third Quartet, you know it works its way measure by measure through a 53-note microtonal scale. The finale of the Seventh is built on a similar plan, but the structural tone row consists of 176 pitches – all different, 176 pitches within one octave, heard in the viola on each successive downbeat. Many other notes are heard in the other instruments whose harmonies link each note to the next, and Tim tells me that altogether there are more than 1200 discrete pitches in the movement – more than one per cent, five times as many as most people can perceive. That does sound a little tricky to play. Tim demonstrated how the players are supposed to proceed from the opening C to the subsequent D7bv-, a pitch ratio of 896/891. The violist is tasked to move upward from this C and come back down on a pitch 9.7 cents higher – just under one tenth of a half-step – than she started on. At the downbeat of the next measure, the violist lands on Dbb–, pitch ratio 2048/2025 – another ten cents higher. And so on for another 175 measures until the viola ends up traversing the octave and ends at C again. A good half of Tim’s paper was spent talking us through the performance challenges of the first two measures. Between the first and second downbeats (pictured below), the quartet is supposed to tune the F to the C and the Bb- to the F, the Ab- and Eb- in the cello to the Bb- in the first violin and the 7th harmonic G7b- above that, and find the 11th subharmonic below G7b-, and, voilà, viola, you’re on D7bv-. It’s just 4/3 x 4/3 x 2/3 x 2/3 x 7/4 x 8/11, and bob’s your uncle, there’s your 896/891. It can’t be too much more difficult than four people traversing a 177-meter tightrope together without holding hands, or manually flying four biplanes in parallel in and out of the mountains through a dense fog. I mean, it’s not like they’re calculating all this while playing an accelerating tempo canon, for god’s sake. The tempo is slow and the rhythms relatively simple, though there are serialized aspects to the rhythm and meter, correlated to pitch differences in the row. Ben recalled that his original proportional scheme would have made the piece last 48 years. Tim Johnson was applauded by others in the audience who had tried to untie this Gordion’s knot and failed; he’s been working on it for five years, and developed a set of computer programs to help him process the cascades of pitches and ratios. Best of all, he played a MIDI version of the movement’s opening 30 measures. It was, indeed, breath-taking: consonances slid into slightly new consonances in recurring patterns, but with no sense of a background fixed pitch grid whatever. [UPDATE: Tim kindly sent me the MIDI file to post, so listen for yourself. It’s done with piano sounds, so imagine a string quartet playing it.] I think I can truly claim that never, in the history of the world’s music, has such deeply-layered complexity sounded so translucent. I absolutely prostrate myself. Imagine Ben writing in pencil, in 1984, a string quartet that would later require multiple computer programs to unravel again! How can a mere MIDI-piano version of 30 measures of a yet-unperformed work change your ideas of what music can achieve? Boulez and Stockhausen, you are hereby blown out of the water, your musical understanding has been revealed as merely rudimentary by this Burj Khalifa of sonic conceptualization. The Kepler Quartet, from whom violinist Eric Segnitz was present for the conference, is expected to record the piece for their series of Ben’s complete quartets on New World. Good. Luck. Thankfully, due to another analysis paper by Daniel Huey of U. Mass., we also got to hear Ben’s Tenth Quartet (1995), which I’d also never heard before. 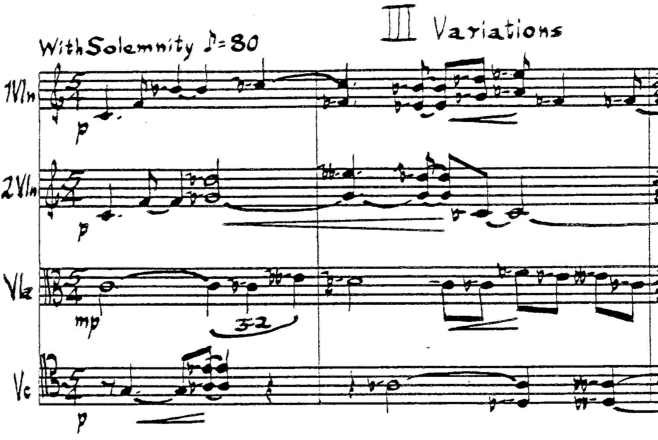 This is a considerably simpler piece, and in fact the final movement is a theme and variations on the tune “Danny Boy,” which isn’t revealed until the very end. The harmonies are tight, fluid, elegantly voice-led, and creamy. The Kepler’s next CD (SQs 1, 5, and 10) comes out in October, and I guarantee you’ll enjoy the 10th. Its simplicity-within-complexity and complexity-within-simplicity will gratify biases all across the spectrum, and with its resonantly pure yet exotic chords it just sounds great. In other news drawn from the colloquium (which was astonishingly dense with relevant news, considering it flew by in a mere 29 hours), the other honoree was the late piano tuner Owen Jorgensen, who wrote the massive book on the history of keyboard tuning manuals in English, Tuning (I won’t take the time to look up its voluminous subtitle). Momilani Ramstrum of Mesa College talked about Jorgensen’s life and said that he rather embarrassed Michigan State as their staff piano tuner by becoming more of a celebrity than most of the faculty, so they made him a full professor and let him teach piano tuning. On the other hand, registered piano technician Fred Sturm of UNM gave a polite but exhaustive tirade against Jorgensen’s influence, charging that since he limited himself to British sources, and Britain was a few decades behind the Continent on tuning issues, he’s created a misleading picture of tuning history that others (myself included) are now quoting uncritically. This sounds perfectly plausible, and doesn’t interfere with the pleasure I get from Jorgensen’s passionate speculations about the relation of composing to tuning. However, it turns out there’s a new tome in English now by Patrizio Barbieri simply called Enharmonic which contains a more accurate and voluminous documentation of the history of tuning all across Europe and across the centuries. You can obtain it, as I soon will, at Barbieri’s web site, and I will expect you all to have read it before I blog on the subject again. Frank Cox passed around a copy, and it looks massively impressive. Microtonal guitarist John Schneider, slapping an endless series of interchangeable fretboards on his axe, started us out with a 100-minute introduction to the history of tuning that hit every salient point, made every principle clear, demonstrated every nuance beautifully on the guitar, and was thoroughly delightful and entertaining. If you ever need a lecturer on this topic, he’s your man. I couldn’t have done it. In five hours or 15 weeks I can make a lot of good points about tuning, but he’s distilled it into a compact traveling road show. And John Fonville led a group of students though a continuum of perfectly tuned tone clusters in Partchian otonalities and utonalities whose beauty we could all appreciate. He’s looking to take that to various schools as well. If I can ever get these guys up to Bard, I will jump at the opportunity. I’ll only add that, in addition to what Aaron quotes, Ben Johnston and I shared a moment I’ll never forget. After my address in his honor, he hugged me and said, “Thank you, thank you, thank you.” I replied, “Ohhhh, thank you.” And he looked me right in the eye with the old twinkle I remember from decades past, and growled cheerfully: “You’re welcome!” False modesty on his part would have been devastating at such a moment. For him to acknowledge some small honor I could pay him was pleasant, but for him to acknowledge what he’d done for me – spinning my life off in a direction I hadn’t anticipated, yet one that expressed perfectly what I needed to do – was ten thousand times more fulfilling. If decades hence any student ever thanks me for my impact on his or her life, I’ll remember how important the words “You’re welcome” can be. Can’t wait to hear that MIDI file… it sounds fascinating. You’re right, Kyle, the weekend was a mind and life altering experience. Full of new and amazing things. Timothy’s paper made my jaw drop in astonishment over and over again. The craft of the music, and how gorgeous the brief sound glimpse. His analysis is a Herculean accomplishment. It was wonderful to meet and talk with you. I hope to see you again soon. Every one of those descriptions makes me wish that every one of those presentations was up on Youtube right now. I’m deeply envious! As a daredevil and a composer myself, I don’t really understand why this is the Mount Everest of string quartets; if someone climbs Mount Everest, people will see pictures and video of it, and the climber’s accomplishment will be recognized and lauded. On the other hand, if a quartet manages to faithfully and accurately perform this piece–as you say yourself–no one will be able to tell, since human ears cannot hear pitches that close together as different pitches. That said, I’m sure some young group will perform it in 50 years like it’s nothing. I just won’t be able to tell the first thing about the quality of their performance by listening to it with my own ears, and if I can’t do that, then what’s the point? KG replies: You’ve misunderstood. No one can hear 1200 pitches per octave played in a scale, but anyone with good ears can hear when Ben’s harmonies are in tune. As I said, the piece sounds really simple. The difficulty is in keeping all these consonant harmonies (which fall into recognizable patterns) purely consonant while they’re creeping across the total pitch space in the tiniest of increments. Wrong notes will be all too obvious, and that’s the difficulty – that, and deciphering all the notation to play the piece in the first place. Look at the musical example I put up: any decent musician could pretty much sing the first violin part, and recognize it if it came back. It’s just getting four such lines exactly in tune, with some intervals based on the 7th and 11th harmonics. Thank you, Kyle, for the kind words. Tim Johnson’s presentation was indeed astonishing and the music is clearly pushing boundaries. John Schneider’s removable fretboard guitar? It’s one of those things that makes so much sense and works so well, so obviously does just what it’s supposed to do, it doesn’t make any sense that you can’t just go out and buy one! I need to add photos of his guitars to this page. Also, I wouldn’t have really thought that the surging forth of an old maudlin tune like Danny Boy could have the effect it did for me as we sat there listening to the 10th quartet at the conclusion of Daniel Huey’s analysis, but of course there is an explanation, and that is the masterful employment of pure harmony requiring more than 12 pitches per octave, not just in the intellectual sense, but in the emotional sense. That brings home the point that all this tuning business is about the expansion and clarification and intensification of expressive quality in music – that is, making real conscious and focused use of pitch as the core material of the art, really getting into the emotional cathartic potential of these extended pitches, and I think Ben’s music is giving us more than a glimpse into that potential. Neat. His quartets have inspired me to experiment with quarter-tones in my next piece, since his music shows that microtonality and tonality doesn’t necessarily have to be in opposition with one another. I know that quarter-tones are just another form of equal-temperament, but at least for myself it’s a pretty good compromise. Difficulty has been kind of an issue, so I restricted the usage of quarter-tones to neighboring semi-tones so it doesn’t tax the performer too much. For this particular project, I’d be lucky to get one or two rehearsals outside of dress, so hopefully it’ll work out. It’s hard for me to imagine a gathering more ridiculous than the minimalists in Kansas City, but this sounds like it has done it. Were the members of the Kepler Quartet in attendance for any of these shenanigans? I’ve been awaiting the second installment of their Johnston cycle for a while now with the assurance that “it’s coming.” Presumably they’ll have to eventually tackle all these challenges, and those than lie beyond the first 30 measures. KG replies: Only Eric Segnitz was there, and he expressed some pessimistic doubt as to whether the project would ever get finished. These guys need a collective MacArthur Award. But a real question: Do you have links to some of the papers, or is it possible to get them once they’re published? Have to head to the NY Public Library tomorrow–seeing they’ve got both the 7th and the 10th available. Thanks again. KG replies: I guess that’s sort of what Ben was doing, or at least, similar music could be made by such means. I think Franklin has some idea of publishing the proceedings, and Tim Johnson’s doctoral dissertation will be obtainable at some point. KG replies: Hi Eric, sorry, I shouldn’t have started a rumor – forgive my bad blogging manners. I’m pessimistic about everything in the arts these days that requires money, and let that color my understanding. I can’t wait to see you guys tackle that Seventh Quartet, and it was great to have you there in Dayton.